Heat oven to 400°F. Mix brown sugar, butter and shortening in large bowl. Stir in 1 3/4 cups flour, the oats, salt and baking soda. Reserve 2 cups oat mixture; press remaining oat mixture in ungreased rectangular pan, 13x9x2 inches. Toss apples and 3 tablespoons flour; spread over mixture in pan. Heat caramels over low heat, stirring occasionally, until melted; pour evenly over apples. Sprinkle with reserved oat mixture; press lightly. Bake 25 to 30 minutes or until topping is golden brown and apples are tender. For 36 bars, cut into 6 rows by 6 rows while warm. Store covered in refrigerator. Rolled oats are whole oats that have been steamed and flattened. Quick-cooking oats differ from regular—or old-fashioned—oats in that they’re cut into pieces before being steamed and are rolled into thinner flakes. Make a date with Date Bars: Heat 1 pound cut-up dates (3 cups), 1 1/2 cups water and 1/4 cup sugar over low heat about 10 minutes, stirring constantly, until thickened; cool. 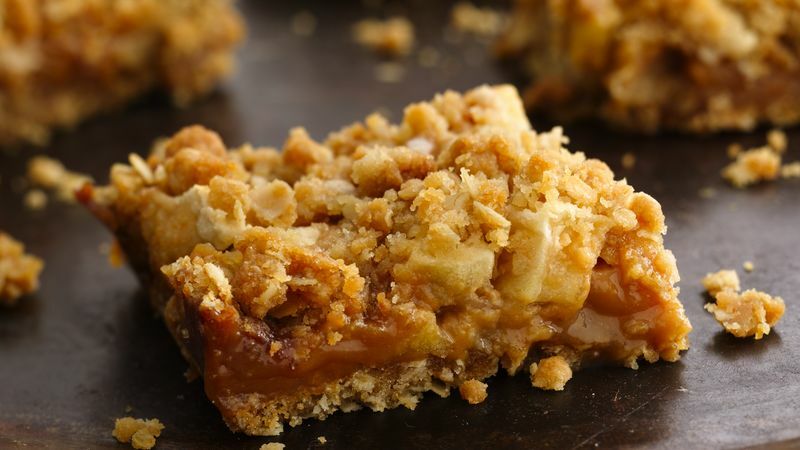 Use date mixture instead of the apples, 3 tablespoons flour and caramels.